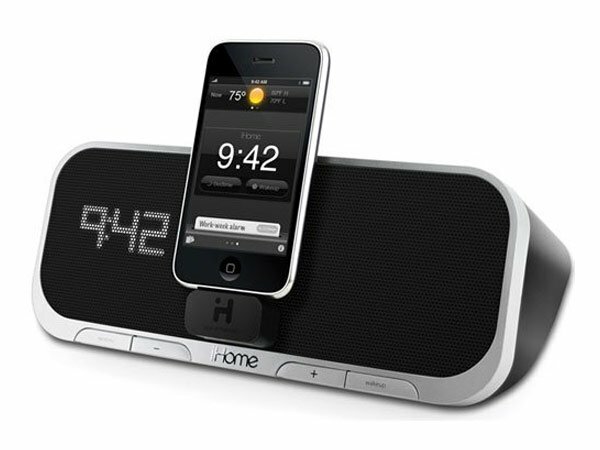 We have seen quite a few different alarm clock docks for the iPhone and iPod Touch here at Geeky Gadgets, the latest one is the iHome iA5. The iHome iA5 is a little different than the rest as it has been specifically designed to work with an iPhone and iPod Touch application. The iHome iA5 works with an application called iHome+Sleep, which lets you adjust a variety of settings on the clock from your iPhone. You can adjust the time, alarm and EQ setting from your iPhone, and the application comes with up to eighteen different software alarms, and you can also choose to wake up to your favourite tunes or even a movie. It also features a line in audio jack so you can hook up other MP3 players. The iHome iA5 can either be powered by mains power or three AAA batteries. If you want one the iHome iA5 is now available for $100, and the iHome+Sleep application is available as a free download from iTunes.